Bring up the Golfer Information form to add a new golfer by clicking on the green plus sign icon on the tool bar (when you put your pointer on it, you will see the text, "ADD a new player"). Only a few fields are required. You can enter as much other information as you wish on this tab. The program will insert an available ID Number. You can change it if you like. 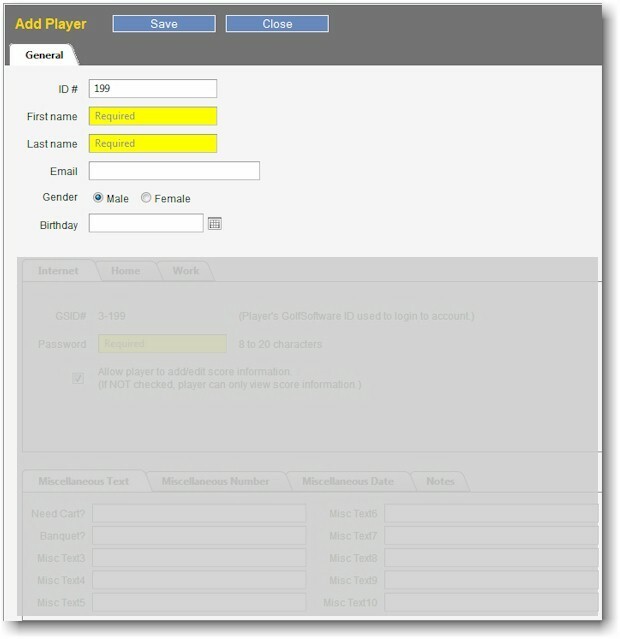 An ID Number can be used once across all rosters that you have created. Gender: Mark the correct gender. Handicap System selects the appropriate rating and slope of each tee according to gender selected. Enter any available data in the remaining fields. Any of the fields can be left blank. Many of these fields appear on standard reports. 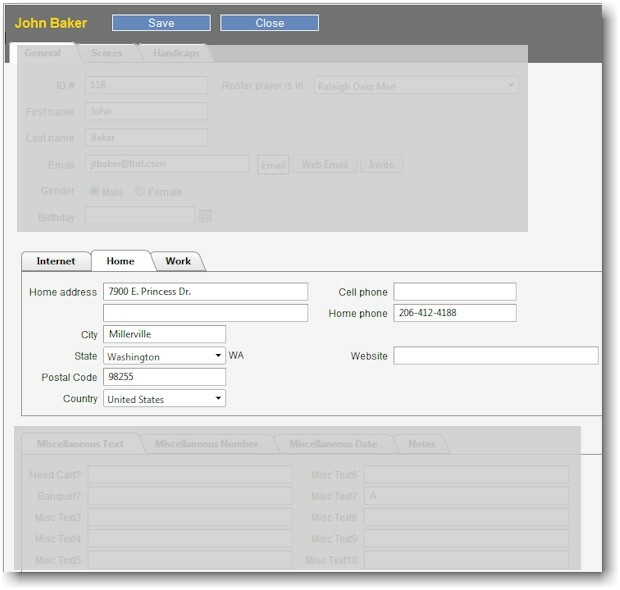 For example, if you enter addresses, you can print mailing labels and address directories. Any field can be displayed on custom reports (see Custom Reports and Custom Views). 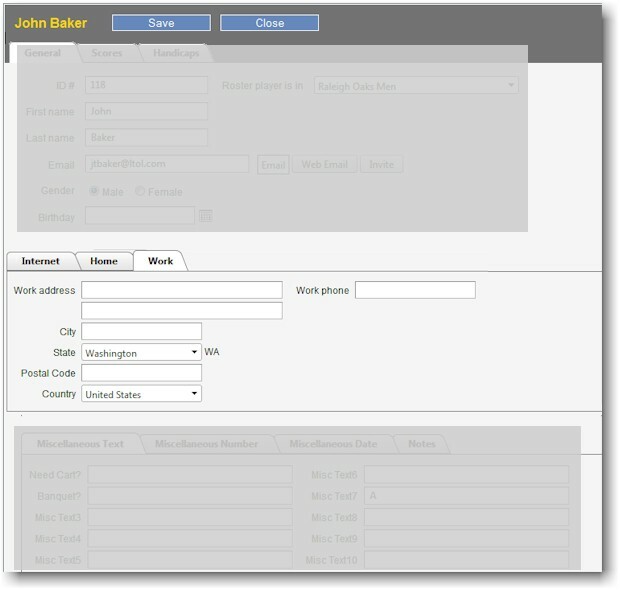 You can even create custom fields for tracking any information your group may need (see Roster Options). Note: The program will not allow you to have duplicate ID numbers. In other words, you cannot have players in a single roster or multiple rosters with the same ID number. It is, however, possible to enter the same person under two different ID numbers, so please take care not to do so. If a player is no longer playing with your group, you can leave them in the roster or delete the player. Control whether your golfers can post scores or only view scores with a check mark in the box. Click to place a check mark in the box. Assign a password for your player's login. It must be 8 characters long. If you leave the password box empty, the required Password will be automatically created when you click on the Save button. The default password is 4 random numbers and the first 4 letters of the player's last name. The player can change this online, if they choose. 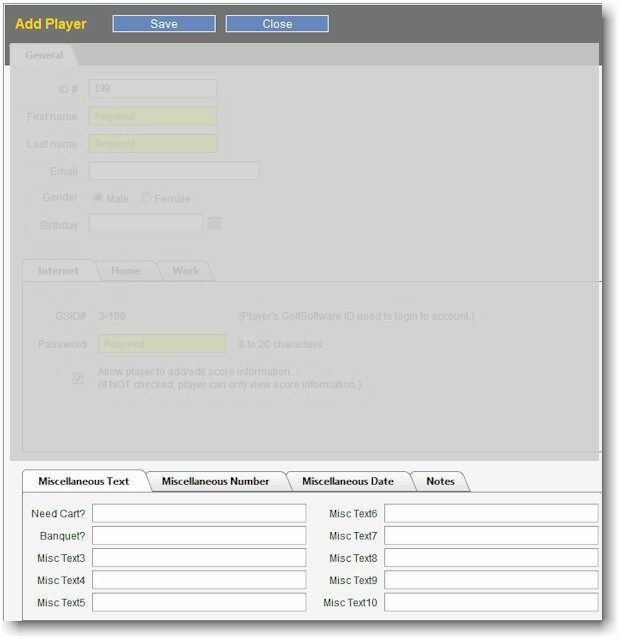 You can email all players, through Handicap System, to provide each golfer with their unique login information. 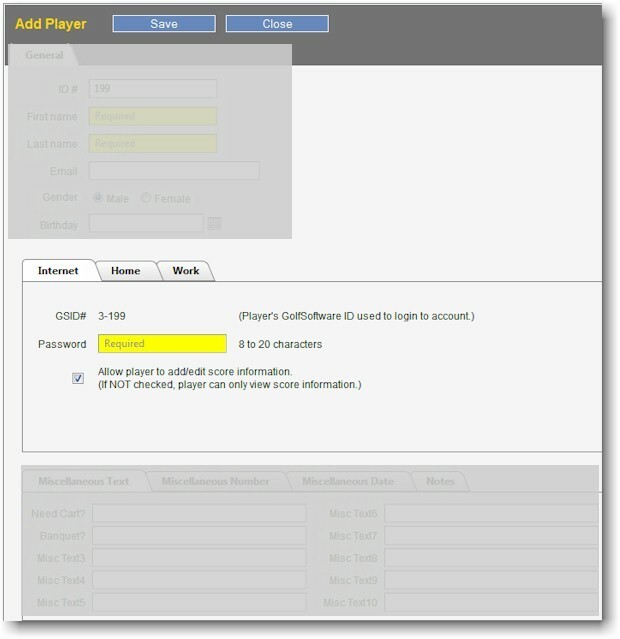 This window also displays the player's GSID# which is the combination of your Group Number and the Player ID Number. Fill in as much information as you wish on the Home and Work tabs. Better yet, when you email your players with login information, request that they fill in the information. The Miscellaneous Text, Miscellaneous Number and Miscellaneous Date fields are set up under the Group Profile. On the player form, you can see if any of the Miscellaneous Fields are marked for a particular player. For example, in the image below, you see the Miscellaneous Text fields are blank for "Need Cart?" and "Banquet?" The Scores tab provides you with separate lists of 18 hole scores & 9 hole scores that have been entered. Which Calculation Mode you have set for Handicap Calculations in Roster Settings. 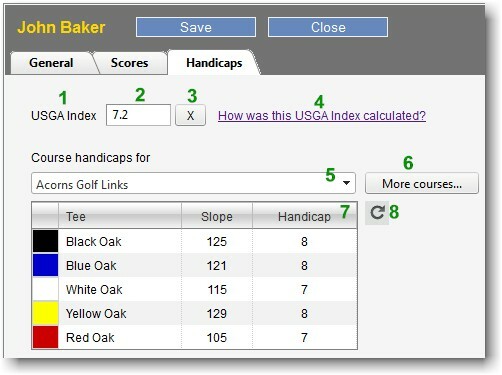 A number for USGA Index (currently shown "7.2"), RCGA Factor or a custom local "Cdex" ("C" of "Cdex" is for "custom"). The "X" button removes the number in the box and replaces it with "N/A". A link that takes you to a page showing exactly how the Index/Factor/Cdex was calculated. Drop down menu to change the course for which Course Handicaps (#7) are shown. If the course is not available in the drop down menu, you can click on the "More courses..." button. Course Handicaps for the selected course's tees. 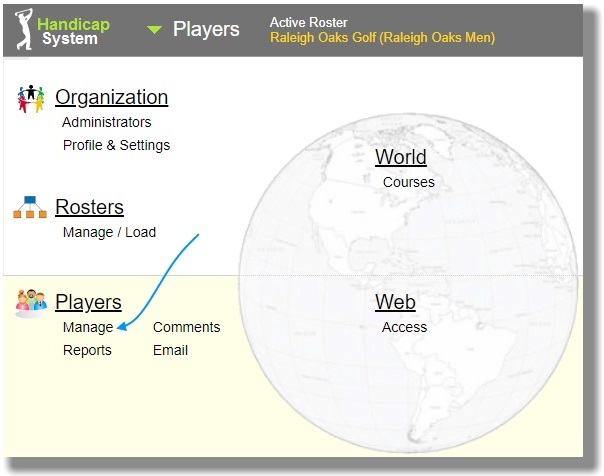 Note: If you want to see Course Handicaps for all your players in your roster for the same course and tees, select the View called "Many course handicaps." Click on the Player Name to edit a player. 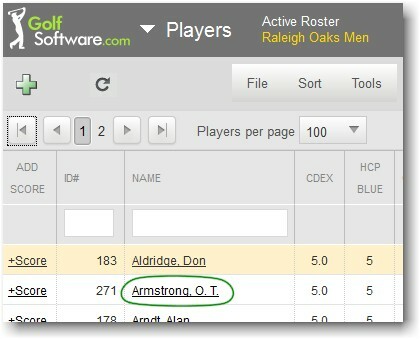 Tip: To quickly move to a golfer, type his\her ID Number or last name in the boxes underneath the column headers. Click on the Player Name to delete and then click the "Delete" button at the upper right corner of the player's page. Click on the "YES delete player" button. A deleted golfer is stored in the "Recycle Bin" for a certain period of time - currently two years. During that time, golfers can be restored to the Roster where they were previously listed. While viewing the list of players in one of your Rosters, click on the Tools button and select Recycle Bin. Select the player or players whom you would like to "Restore" or "undelete."